Hey, what’s up everybody. In this video I’m going to show you how to use the Google Keyword Planner tool. To use this tool you do need a Google AdWords account. Once you have that set up log into Google Adwords, and this will be your Google AdWords home page. Once you’re here, click on the tools and analysis button at the top. Then, click Keyword Planner. The tool will show you three options. For the sake of doing keyword research we want to click on the top one where it says search for keyword and ad group ideas. You have a number of options here. The first box is where you enter keywords related to your product or service. So, if you’re selling pianos, you’d put maybe pianos, musical instruments, and things like that to generate the most amount of keyword ideas. Or, you could put your landing page which could be your home page or a page you’d want people to land on in search when they search for that keyword. There is a number of options here that we’re not going to do too much with, because for most people they default exactly how you’d want them. The first is geo targeting. You can target a specific country, a specific language, or a specific search engine – other search engines that are within the Google network like AOL. 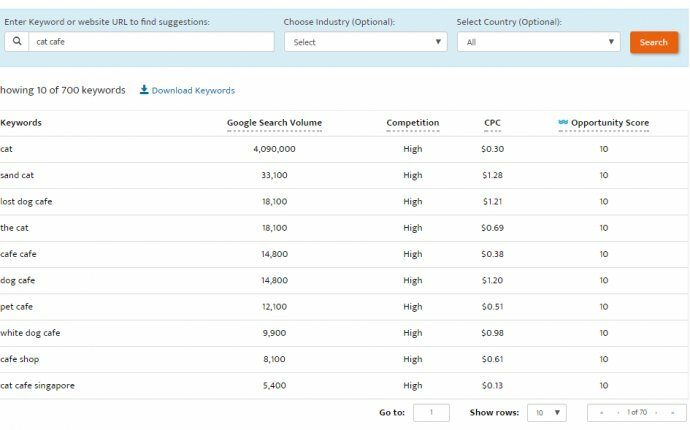 You can also customize your search and filter out keywords that don’t have a minimum monthly search threshold or a cost per click above or below a certain point. You can also hide keywords that you already have in your AdWords account or that you think are relevant and will show up. I recommend just keeping all this as it is if you’re going to be targeting Americans searching in English in Google. For this video example, let’s put in a keyword like backlinks. Once you’ve put in a keyword or a number of keywords click on the get ideas button. This’ll bring you to the actual Keyword Planner tool. The first thing you want to do is click on keyword ideas, because the default is ad group ideas which isn’t ideal for doing keyword research. So, click on keyword ideas. Next, you want to make sure that the keyword volume that it shows here for average monthly searches is set to exact match. What that means is that you want the keyword volume to reflect what people search for exactly. By default, Google sets the keywords to broad match. This means, for example, this keyword get backlinks, when it shows average monthly searches at 720, that includes people searching for how to get backlinks, where to get backlinks, how to get authority backlinks, et cetera. When you set it to exact it ensures that the search volume you’re seeing is only for people who search for the words get backlinks, with nothing before or nothing after. To do that click on the little pencil icon over here and set add keywords as exact match. Then, click okay to make sure all of the match types are set to exact from now on. Sometimes that will dramatically change the search volume for certain keywords. In this case, we have the term backlinks, and that has an average monthly search volume of 5, 400. That’s, obviously, how many people search for that exact keyword per month with nothing before or nothing after. Another useful piece of information from the keyword tool is if you hover over this you can see the monthly searches over the last 12 months which is the trend. So, in general, if you’re going to be targeting a keyword and putting a lot of effort and SEO into that keyword you want to make sure the trend is going in the right direction which is up. In this case, we can see that search volume for backlinks has taken a dip over time. This might not be the best keyword. Obviously, there are always some fluctuations, but over a year you can usually tell the direction that a keyword tends to go. Next, you can look at the competition. Obviously, this isn’t search engine competition. This is competition for people advertising within AdWords. But, this can give us helpful insights because if the competition is really high that can be an indicator of how easy this keyword is going to be to convert and to monetize. For example, what are backlinks. This is an informational keyword for someone who doesn’t know a lot about SEO. They’re just wondering what the term means. For that reason, the competition is quite low. So, people landing on your page, if you were to rank for this keyword, probably won’t convert because they’re very much beginners. If you were selling backlink packages or link building services these are not the type of people who would want to invest in your service. It’s good to take a second to look at the keyword competition in terms of advertisers. Again, this isn’t SEO competition. This is AdWords competition. You can also get that similar indicator by looking at the average cost per click. For example, the more people are willing to pay for a click, the better the keyword is. That’s not always the case. I find the keyword competition is a slightly better indicator of how well that traffic will convert. But, it’s just another piece of data to pay attention to.